The season finale is a shocker, with series regulars on the outs and new people ending up being in. Politics is serious business. So many movies and television shows detail the cutthroat world of Washington D.C., while others try to take a more lighthearted view of the realm. HBO's VEEP is the latter, poking fun at those in power and how they wheel and deal with our laws and regulations. The critically acclaimed and award-winning show will start its sixth season on April 16, 2017, and in anticipation of the continuation of the series, Season Five is set to hit stores shelves on the 11th. As Season Five begins, the battle starts to become the next elected president as Selina Meyers (Julia Louis- Dreyfus; Seinfeld) and her opponent tied in the election. She woos senators and looks for possible victory in Nevada. As the season moves forward, Selina finds herself embroiled in a few scandals, including a tweeting fiasco ultimately blamed on the Chinese and ironically ends up in negotiations with the same country later in the season. As the season winds down, it looks as if Tom James (Hugh Laurie; House) might win the Presidency only to be usurped by someone else entirely. Meanwhile, the staff is creating their own chaos as Mike (Mike Walsh, Ted) tries to improve his health so he and Wendy (Kathy Najimy; Sister Act) can adopt a Chinese baby and Catherine (Sarah Sutherland; Shut Up and Drive) starts a documentary of the behind the scenes view of the white house. Of course, there is also the episode when they investigate who called Meyers a nasty word (beginning with the letter C) only to find out it was all of them! There is also the heavier moment when we find out Jonah (Timothy Simons; Inherent Vice) has been diagnosed with testicular cancer. Louis-Dreyfus reminds us why is she is an award-winning comedic actress. Her portrayal of the accidental president is spot on and hilarious. Of course, she has been making us laugh for years so her terrific portrayal of President Meyers is no surprise. Surrounded by a strong supporting cast, including Anna Chlumsky (My Girl), Tony Hale (Arrested Development), Matt Walsh, Timothy Simons and Reid Scott (My Boys), the show seems to be a well-oiled machine chugging along season after season. Creator Armando Iannucci (The Thick of It) and the writers take this serious subject and turn it into comedy gold, showing us how complicated and humorous politics can be. The show also focuses on the personal lives of these people and how they cope with their jobs, life and each other. They do use some salty language one doesn't necessarily associate with the leader of the free world but somehow it works. The season finale is a shocker, with series regulars on the outs and new people ending up being in. In true season finale fashion, there are cliffhangers which make the audience antsy and anxious to tune in for Season Six. There are unanswered questions and unresolved issues and, of course, we all want to know what will happen next. The Blu-ray is presented in 1080p high definition video with a 1.78:1 aspect ratio so the picture is sharp and clear. The DTS-HD Master 5.1 audio is well mixed and the dialogue is discernable throughout. The disc offers only a couple of extras including deleted scenes and audio commentaries. There is also a digital copy to download. Terrific acting, great scripts, interesting plot lines and smart direction make this show a winner and well worth your time. Once again, HBO has a sustained hit on its hands, so, if you didn't watch last season (or any of them so far), it's time to catch up. You only have a week before President Meyers returns to the small screen. 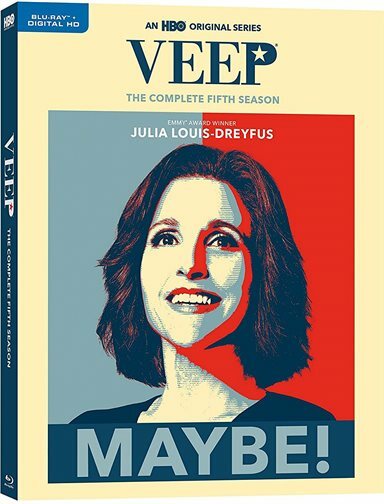 Download Veep: The Complete Fifth Season from the iTunes Store in Digial HD. For more information about Veep visit the FlickDirect Movie Database.